Route 45 is scheduled to be rerouted around the stretch of road known as the Millburn Strangler. Two plans were taken under consideration. Route 45 would be rerouted through Old Mill Creek farmland (the Orange Line). Or Route 45 would be rerouted through a number of Lindenhurst subdivisions (the Pink Line). Given the two options, the enduring mystery is why the Lake County Board, along with the Illinois Department of Transportation, chose to reroute Route 45 through some of Lindenhurst's neighborhoods, playlots and schools. property in our village could be developed along the proposed bypass, which would lead to additional sales tax revenue for the Village, the County, and the State. When our Special Retail District is built out, I estimate that the State would receive a minimum of $900,000 per year in additional revenue (50,000 sf x $300 generated per square foot x 6% sales tax). 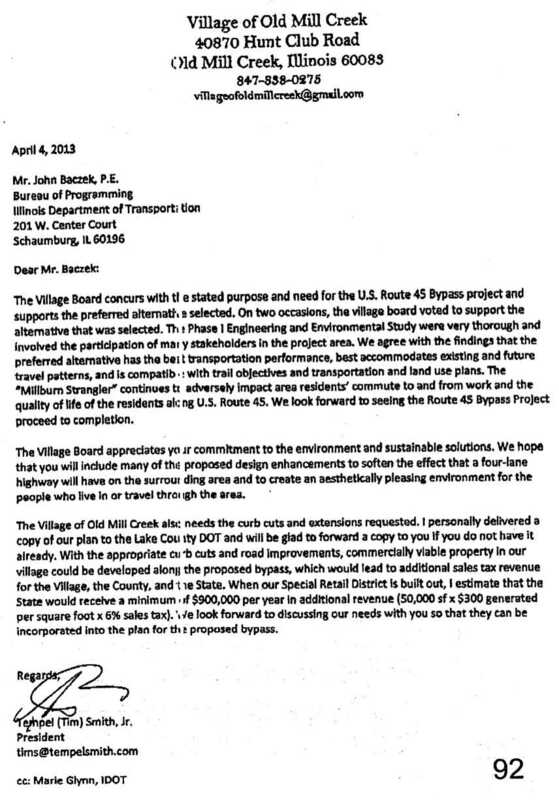 This smoking-gun document makes evident why the Lake County Board prefers to reroute Route 45 through densely populated meighborhoods and not through unpopulated farmland. If you want a piece of that 6% sales tax action, those commercially viable shops better be where all the people are. In other words -- well, duh, unpopulated farmland does not shop. Sometimes the solution to one mystery raises more questions than answered. Under the proposed Route 45 plan, some dozen Lindenhurst homes will be razed and their families uprooted. What will entice these potentially free-spending consumers back to the Shops of the Millburn Strangler? Your LakeCountyEye recommends awarding each family a $100 gift certificate. Looks like it should be renamed the "Millburn Commercial District". So what are you complaining about the fact that they aren't going to destroy a historical town just to get a few cars up and down a road?! Get real! Who cares about those stupid sub division houses I'm sure they will pay those people well for the land! And of course they need to make money how do you think they are gonna pay for building the road?! Get your head out of the sand.